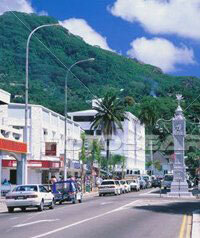 About 90% of Seychelles’ population lives in Mahé (a prime area). The granitic island is mountainous and thickly vegetated at the centre, and flat nearer the shore. The main road curves along the coast, providing easy access to 75 beautiful beaches. Smaller streets connect the more developed east region to the west area. The north region is highly populated. It has the best beaches and the most modern business establishments and accommodations. Demand for housing in this region has escalated in recent years, and land reclamation is now in progress. The south region is more remote and still untouched, to the satisfaction of local residents who do not want excessive development at nature’s expense. The town of Victoria is the seat of administrative and economic activities in Mahé. Though geographically small, it is the country’s largest residential district. About one third of the population resides here. Important smaller residential areas here are Anse-Aux-Pins, where the fresh market is located; Cascade, which is near the International Airport; Les Mamelles, which offers modern flats; the old Point Larue, also a commercial district; and the relatively new and already densely populated Roche Caiman, which offers top quality sporting facilities on reclaimed land. Beau Vallon Bay is one of the island’s most beautiful beaches. Sea-view and flat land properties here are currently for sale. 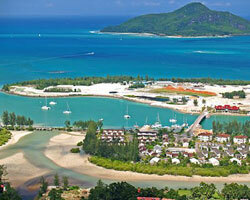 Eden Island is marketed as a self-sufficient, environmentally-friendly international residential and commercial marina in Seychelles. The Eden Bridge connects the 40-hectare reclaimed island to Mahé. Freehold-title luxury housing includes 450 private villas, maisons, and apartments. The villas’ architecture was inspired by old plantation houses and incorporates all the comforts of modern European living. Each home has direct access to a private beach, which provides individual mooring for boats. To support the environment, electrically-powered vehicles complete the package. There are also restaurants, shopping centres, and other services. Not surprisingly, property prices are quite steep. The capital town of Victoria, also known as Port Victoria, continues to adapt to social and economic changes. From its Creole beginnings as a fishing village, it has become a busy network of wide roads and narrow streets connecting churches, schools, institutes, banks, internet cafés, commercial shops, art galleries, and medical facilities. The nation’s international airport is located here. Despite its rapid urbanisation and high concentration of activities, Victoria manages to hold on to its culture. Rundown colonial houses still stand. The Clock Tower, albeit awkward in its placement at the small town’s centre, mimics London’s Big Ben and has served as an important landmark since 1903. The National History Museum, an old seminary called Capuchin House, and Kenwyn House, a lovely manor in the French colonial style. The Victoria Botanical Gardens nearby are a lovely place to visit on sunny days. Residential tourism has blossomed in the capital, with the number of commercial and residential housing types growing. Two- and three-bedroom houses and apartments, luxury villas, small beach hotels, and office spaces are for rent or sale. Beachfront plots and sea-view land properties are also available. More development plans are carried out on existing districts and reclaimed lands.